We are not too far away from December, being the first winter month lasting until February in the UK and I wanted to go through how to keep guinea pigs warm in winter. This will apply more to owners who have to keep them in their hutches outside over this colder period. If they are kept inside, then regulating the temperature will be fine with the heating up to 20 degrees and over and also not having them in a draughty room. There may be many reasons why you simply cannot have your guinea pigs inside your home permanently. But they need to be warm and dry, otherwise they will develop nasty illnesses. In the case of them being in a hutch outside in the garden, make sure there is a plastic cover over the hutch, as it may rain more. Placing sheets of tarpaulin or towels will keep warmth in. Fleece bedding will do a good job to and plenty of hay. Other beddings like straw is very good at insulating and towels could be good to place in several areas inside, so they can snuggle up. Heat pads that are placed in the microwave for a little time are good to use, so they can sit on a nice warm place. Put a few hiding places around and warm ones like fleece houses. Use bottle covers to stop water from freezing. In terms of a hutch, always purchase the best one that will survive the great british weather, especially in the winter time. Place a thermometer so you can see what the exact temperature is outside. Obviously you will be bringing the guinea pigs in for their playtime in the daytime, if not in the house, a small shed. Sheds made for guinea pigs are great because they can hold in the heat with it being bigger to place more items inside. 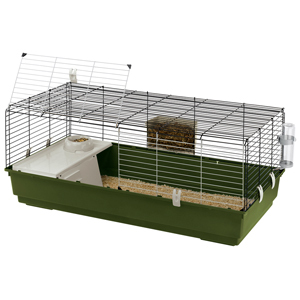 If you able to move the hutch, place it inside a shed or a garage that doesn’t get used for a car, because the fumes are poisonous to guinea pigs. Also, use a portable heater in these situations. I want to mention an outside cage called an Eglu sold by the company Omlet based right here in the UK. These are designed to keep the inside well insulated by trapping air between the walls. It is a decent size and there is a run that can be attached on. Remember if there is severe wintry weather like long periods of snow, do not risk leaving them outside however good you have insulated the hutch/home outside. Very warm and cold temperatures really can affect guinea pigs, if they are not properly cared for, then they will suffer and go down hill fast. They cannot cope with trying to deal with body temperatures that well. Bring them inside and put them inside a cage like this from Pets at Home, this allows for plenty of space and is a good temporary home. If your guinea pigs are suffering with cold like symptoms, then take them as soon as you can to a vet. Keep feeding the same healthy diet of vegetables, including vitamin c tablets so they stay fit and healthy. I wanted to have a guinea Pig and this article gave me an outlook of how it feels to have one. Lots of information and this article is going to help lots of people who own a Guinea Pig. I’m glad that I found this article. And glad that you shared this article with us. OMG I would never leave my man outside in the winter. I don’t know why people have pets they don’t want around them. Silly. Anyway, great advice on bringing them inside when it is severe. I have a pet guinea pig and a pet rabbit, and both reside in beautiful hutches two stories each in my room. It does take up a lot of room, but I love them and want them to be warm and cheery. Thanks for sharing this great info. I hope to read more great info from you! It is good if you can have them inside because they will get more social interaction and its easier with keeping the temperature warm. I bet your guinea pig and rabbit both love being in their hutches. Piggies are such precious little buddies. It’s up to responsible owners to make sure the pigs are cared for! We live somewhere with a tropical climate, so the challenge here is making sure our cavy buddy stays cool. I can only imagine the amount of effort needed to make sure they’re comfy in a cold environment! If people have guinea pigs inside then obviously it is easier to control when its very cold or hot outside, although in the hot months not leaving windows open in extreme heat and iced water bottles. Keeping them in a shady part of the house and in winter, making sure the heating is up enough and not in a draft area. But it can still be a bit challenge, you have to really keep an eye on them. I think once everything is in place for them to cope more easily in different temperatures, then its not too bad. Pet animals are really near to our hearts. What we feel as persons are not far to what they feel too. Although they are more tolerant than us they still need care from us. Yes, I never knew that bottled warm water is one way of providing heat and this may remain for hours. This is such a reversal of having cold bottled water for boxers, hahaha! You are right pets depend on their owners to look after them the right way. The warm bottled water is a really good way at keeping them warm. You offered some great information on how to keep guinea pigs warm in the winter. I don’t know why anyone would even think to leave a pet outside in the cold weather, but you gave some great advice for the owners that do. I have never owned a guinea pig, but I find them so cute and adorable. I also didn’t know that you can give guinea pigs vitamin c tablets when they suffer from a cold. Thanks for sharing your tips, and your pictures are so cute. The Vitamin C tablets makes sure that they are getting enough vitamin c and keeps them in a healthy condition. The tablets would not help them if they had a cold, you would have to go to the vet, so they could give you some medication that would help to clear it up. If they were out in prolonged cold weather just like us or were in a dirty environment, they could develop pnuemonia or respiratory illnesses. They can go down hill very quickly, its an immediate visit to the vets. You have a number of great tips. We certainly owe it to them to make sure they are warm, dry, comfortable and safe. I recall when I was a kid in Lawrence, Kansas, there were a lot of feral guinea pigs in our neighborhood. We had an alley behind our house that was lined with garages that were separate from their house. Practically every one had guinea pigs living within, along with the odd opossum. They didn’t want to be caught and there were hundreds. I wondered at the time how they managed to stay fed and warm in the winter. I guessed they figured things out enough for some to make it through to the Spring and keep reproducing. Since that time I have always been fascinated by them, though never have had them as pets. In South America they evidently love to eat them and deep fry them whole. I imagine that is a pretty cringe-worthy idea for you. Wow that’s a lot of feral guinea pigs, its interesting to see them. Yes I would never be able to eat a Guinea Pig in South America, but I respect thats the way it is.